Mullein leaf tea is becoming increasingly popular. The herb tea is taken from the mullein plant, which is a native of Europe but can now be found in many parts of the world. It has a number of names in folk medicine, including candlewick plant, flannel leaf, and donkey’s ears. Mullein once had the status of an official medicine and has a number of health benefits. Mullein tea is brewed from the leaf and the flowers of the plant. The leaf can be steeped in hot water but must be strained well to remove any of the hair-like strands which form on the leaf. These can be irritating if consumed. The tea can be cooled and used for compresses for external applications. Respiratory problems such as bronchitis, colds, coughs, and sore throats. Mullein tea has anti-bacterial properties that can help to reduce inflammation and infection. It is also a natural expectorant that can expel excess mucus from the airways. The tea is a natural sedative, helping those who suffer from insomnia. Mullein is also a natural remedy for easing headaches and migraine. It is calming for muscle spasms and is a natural pain reliever. It can ease the spasms associated with allergies such as hay fever and can reduce the symptoms of asthma. Mullein tea can help to fortify the bowels and the liver. It can help the body get rid of toxins. It balances the bowels and thus can ease both diarrhea and constipation. Its healing effects can soothe and reduce hemorrhoids. Mullein is a very gentle herb, which is safe to use for children and can be combined with a number of other herbs to ease the symptoms of a number of illnesses that afflict children. Its positive effect on the respiratory system means that it is a useful remedy for whooping cough and croup. 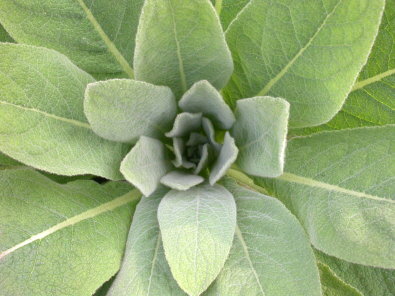 Mullein leaf tea can be applied externally to sores and wounds to help keep them clean and free from infection. It is calming when applied to skin rashes and burns and can promote healing. The tea can improve the functioning of the thyroid gland. Those on medication for thyroid problems should consult their doctor before using the herb. The cooled tea can be applied to cold sores as it has antiviral and antibacterial properties. Its cleansing properties can help to ease and prevent infections of the urinary tract and bladder. There have been very few reported side effects to mullein. Some people may suffer stomach upset when they first begin using the herb. This usually happens when too much of the herb is being consumed, but most people would have to use vast quantities for a reaction to occur. Allergic reactions are rare, but symptoms such as a rash, breathing difficulties, or chest pains should be reported to a doctor.